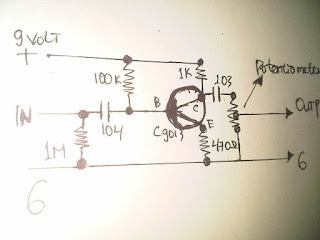 The picture above is a simple schematic for the circuit. This section is highly recommended to be placed at the beginning of your pedal circuit. potentiometer will adjust the power of sound, it's served as volume. you can use 9 volt for supplied this circuit. This scheme only simple but you can use for boosting the audio signal. I use the C9013 or 2N9014 transistor. pole as a pair of output signals, because they must be in pairs, which will be connected to the negative and input parts of your pedal. be careful and do not make some short. If you use this scheme, it is expected to test in advance.my experience using this scheme results are pretty good. but you have to add a resistor at the input transistor to reduce the gain. It depends on how the sense of sound you need. In assembling this booster circuit, how to soldering and wiring determine the purity of the output audio thereof. You could add some supporting components according your creativity. in the world of audio effects, ekseprimen very important to do, in order to create the sound quality is different from the others. the more accurate your assemblies, the better the sound that comes out through a speaker studio or stage. talk about the audio effects, and ic transistor is needed as the signal source is needed. This circuit can also be used for boosting any distortion pedal. 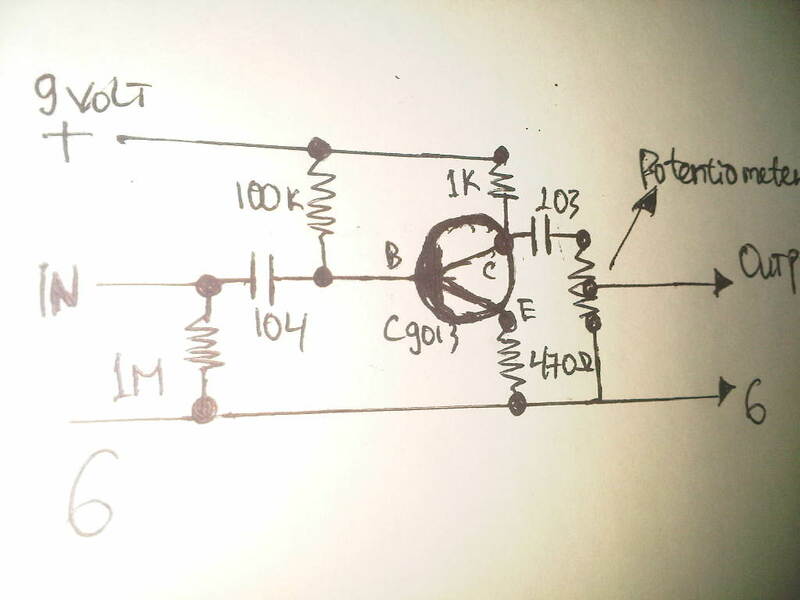 This principle is simple circuit amplifies the incoming audio signal and send it to the next circuit. If you want to add a character blues when using this circuit, you need to add two diodes mounted in parallel opposite and connected to a section of track out and ground lines, this is called clipping diode. If you are creative enough, you can design a circuit schematic is based on the above picture to your liking your own by adding a few components or a specific block in order to be a good circuit schematic for you.